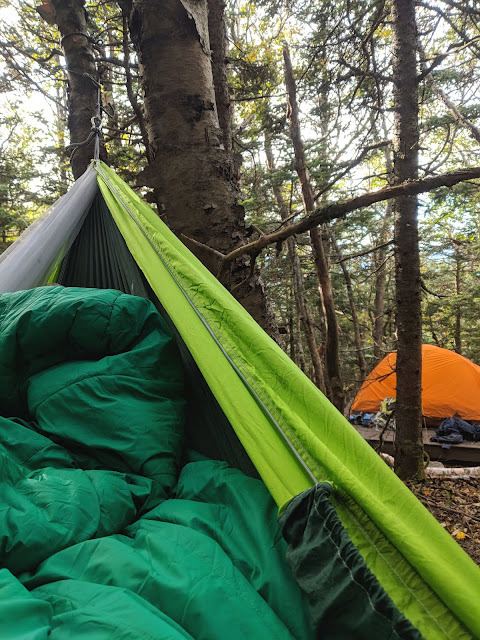 For someone who loves to spend time in the woods, who loves to hike, camp, sleep under the stars and drink wine by a campfire, it's surprising that I have never been backpacking. Backpacking as in carried everything I needed for two days and one night deep into the woods to sleep under the stars, far away from a road or my car. No car camping here, everything has to fit in an oversized pack on your back and there is no running back to the car for forgotten items. 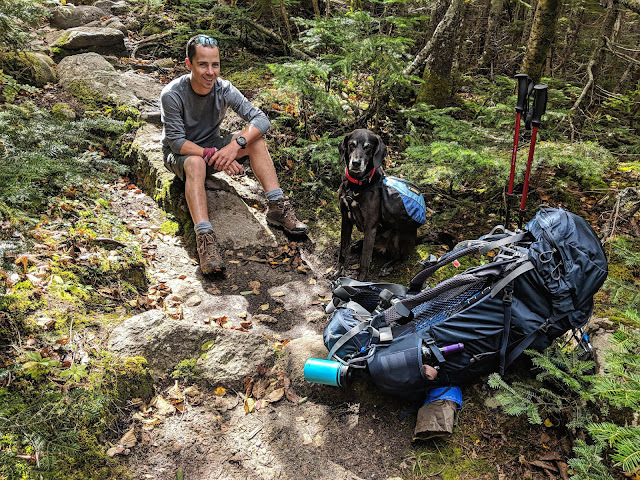 Truth be told, I was always a little intimidated by the idea, but as I saw friends out in Utah on these great backpacking trips, I became more comfortable with the idea that I too could carry all my crap into the woods and sleep under the stars away from crowded campgrounds. 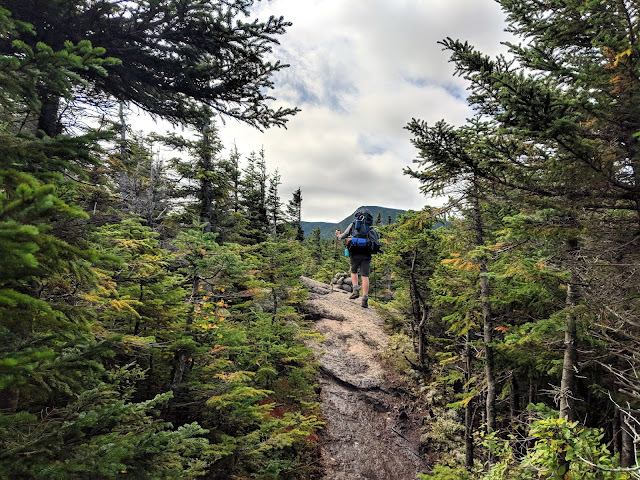 I didn’t want to wing it so for my first backpacking adventure, I called my friend Ryan and we got some dates on “Katie Wanders Ryan Saunters” shared google calendar. 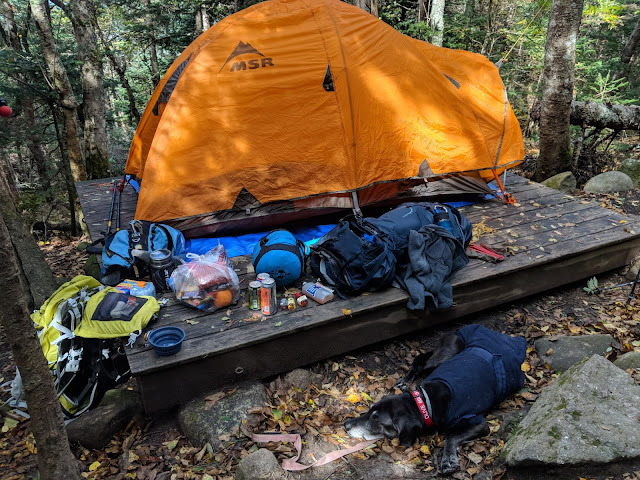 Our original plan was to do an overnight on the CT section of the Appalachian Trail, some other backpacking trip further up north, and then tackle the famous Presidential Loop. 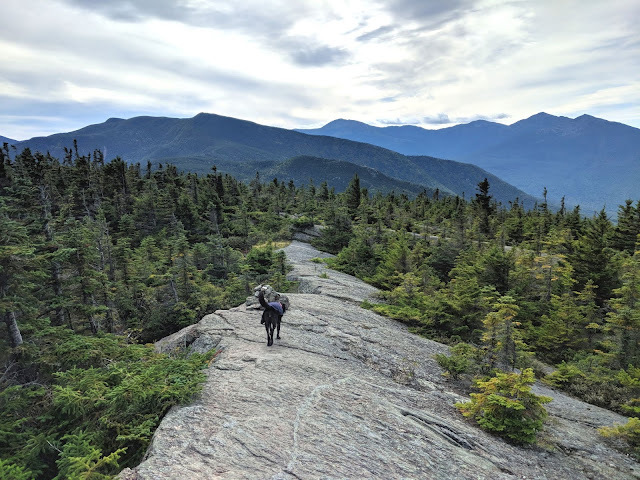 Well, summer slipped on by as it tends to do and two weeks out I was looking at my google calendars reminder that it was PRESIDENTIALS WEEKEND (I had yet to step into the woods with my heavy pack and tent). 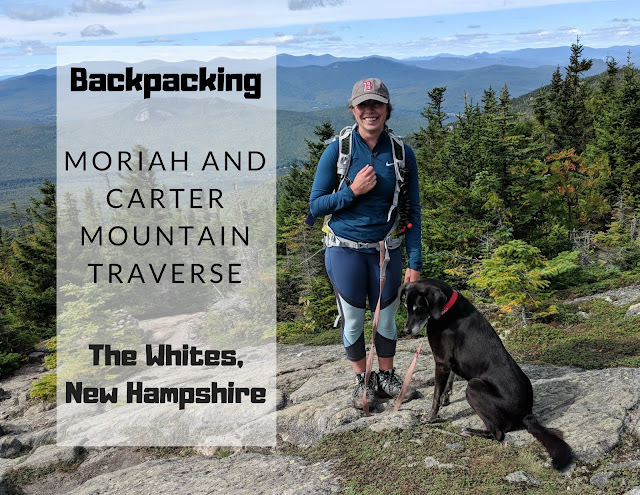 I asked Ryan to find something a little more doable for my first backpacking trip and he sold me on the Moriah and Carter Mountain Traverse in the White Mountains of New Hampshire. For once, it was so nice to have someone else plan all the details so I went into the hike blind, trusting Ryan’s experience and thoroughly enjoying the art of “just showing up”. 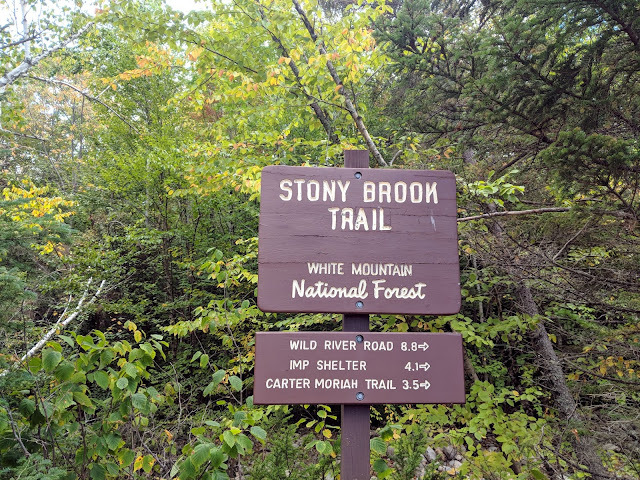 The plan was to park at Stony Brook Trailhead and follow the Stony Brook Trail up to the Appalachian Trail. 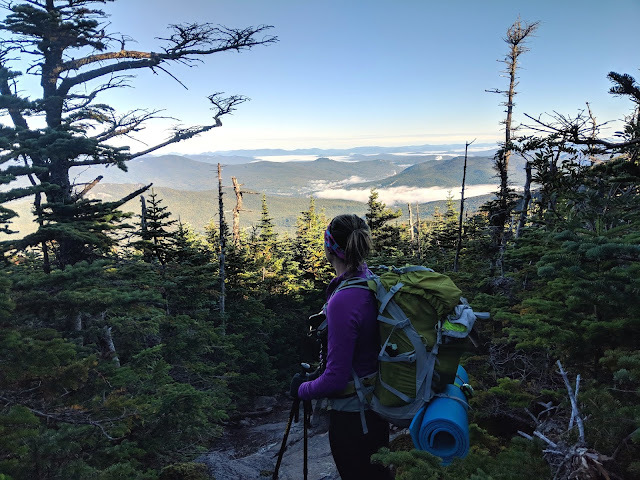 We would head to the Imp Shelter, drop our bags, set up camp, and backtrack to Mount Moriah, our first of six 4,000’ summits on the trip. 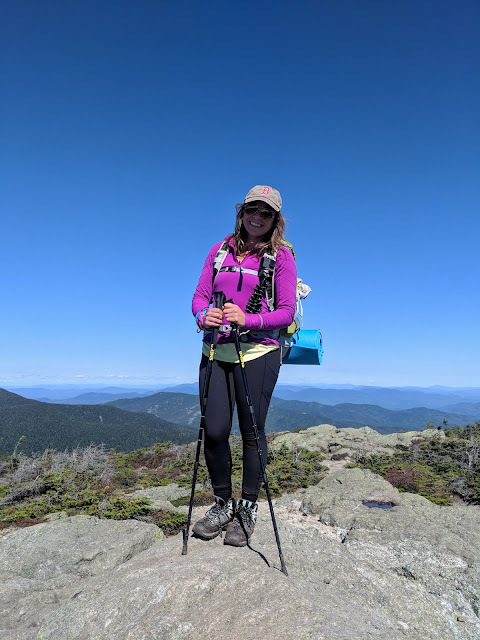 We would then return to camp and in the morning head out along the “ridgeline” and summit North Carter, Middle Carter, South Carter, Mount Hight, and Carter Dome. 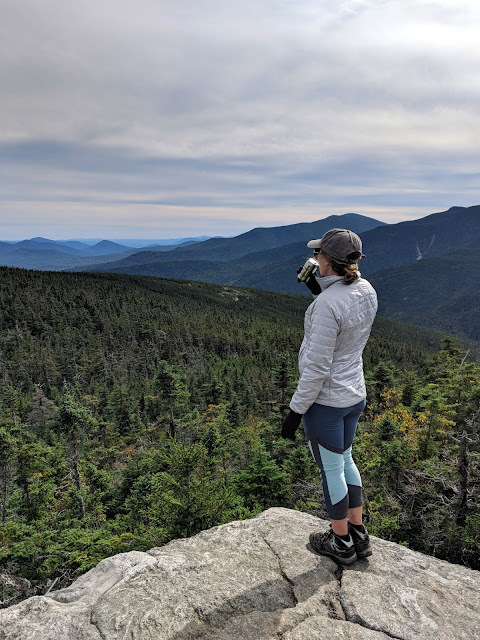 After summiting Carter Dome We would head down the 19 Mile Brook Trail to the 16 Mile Brook Trail and end up at a different trailhead about 4 miles away. We were going to either hitchhike back or call an Uber. 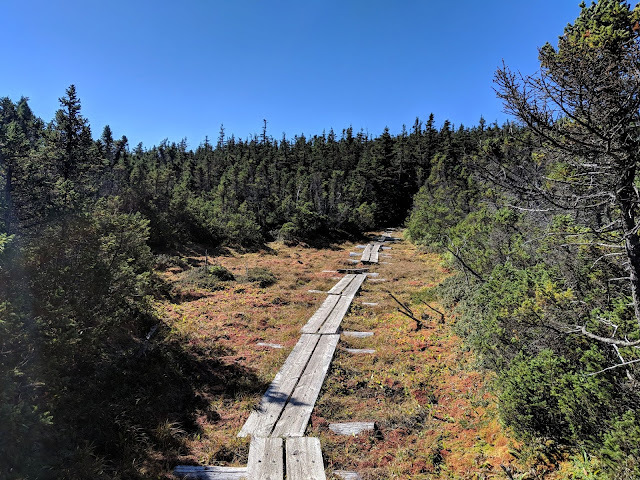 The hike was supposed to be a 16.3 mile loop, and I was told Day 1 would be a short easyish day with about 6 miles but most of the elevation, followed by a 10 mile days “easy hike” along the ridge line before heading back down. Doable. Let me tell you what it was really like. A 24 mile hike with almost 7,000 feet of elevation gained - no flat sections - fun but hard work. 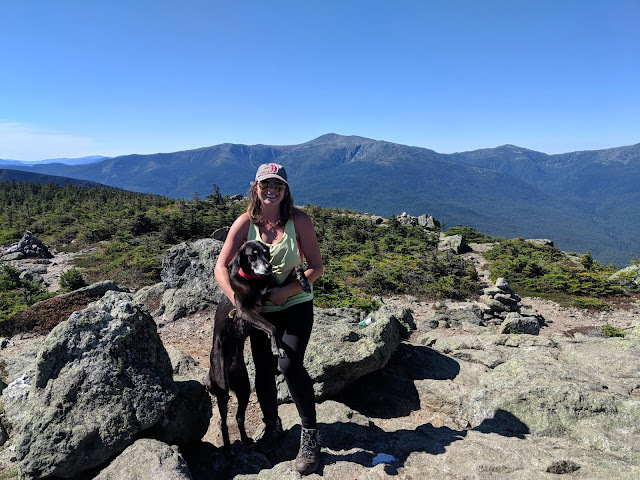 I was reminded of the reason I started writing Katie Wanders, to improve inaccurate trail guides and give someone all the information they needed to successfully (and safely) finish a hike. 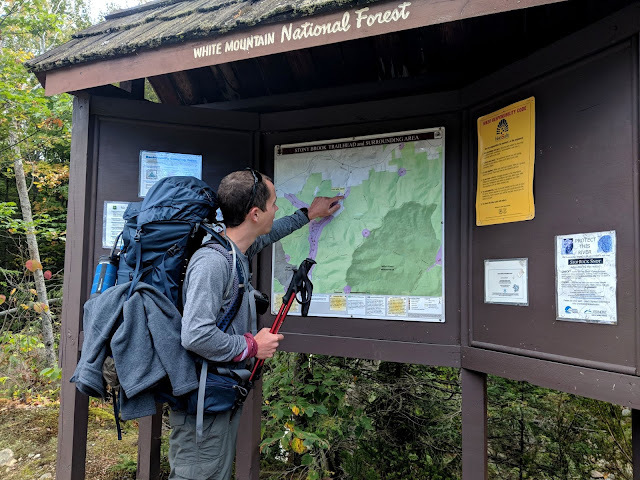 6 miles is a big difference when you consider elevation, heavy packs, and the number of resources you packed for the trip. But I digress. Good company and a few extra beers made the weekend a complete blast, even with the extra miles. 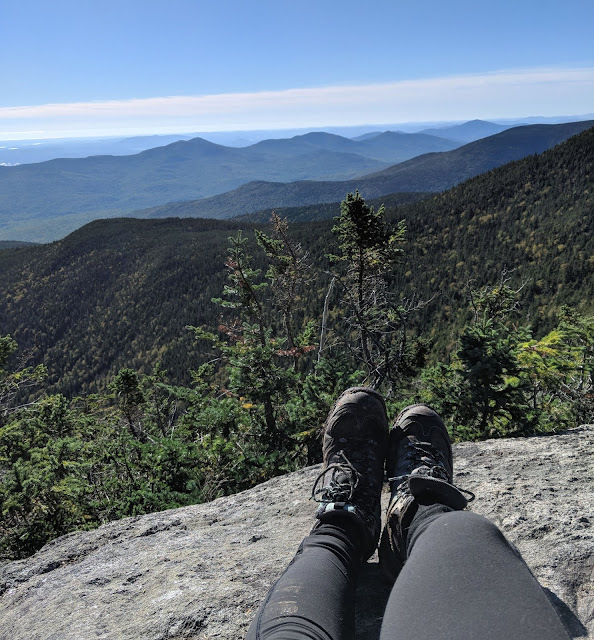 Let's talk about this hike, the insanely beautiful weather, how much fun I had, and how I just may be addicted to backpacking. 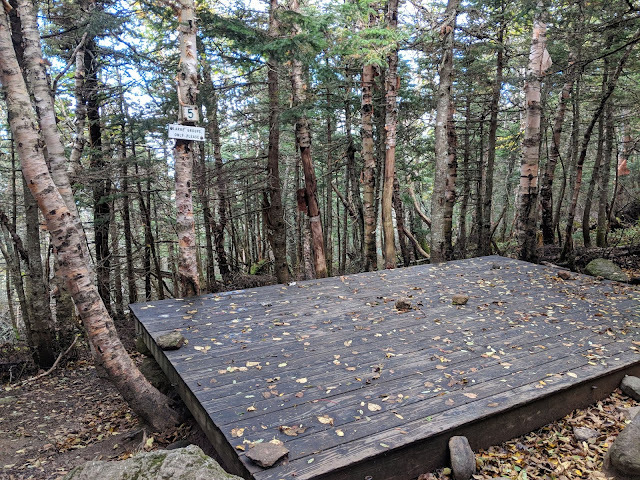 Campsite: Imp Shelter along the Appalachian Trail - outhouse, tent platforms, cooking area, shelter, bear box, and shelter. Water sources: Brook at Imp, potable water at Carter Hut. Route: Up Stony Brook Trail (blue blazed) about 3.6 miles, 0.7 miles on the AT (white blazed) to Imp Campsite turn off. 0.2 miles down the Campsite trail. Back 0.2 miles to the AT, 0.7 miles along AT North, and 1.4 miles to Mount Moriah (and then back the same way to the Imp Shelter). By dropping your bag and setting up camp, you do backtrack and add 2.4 miles each way. 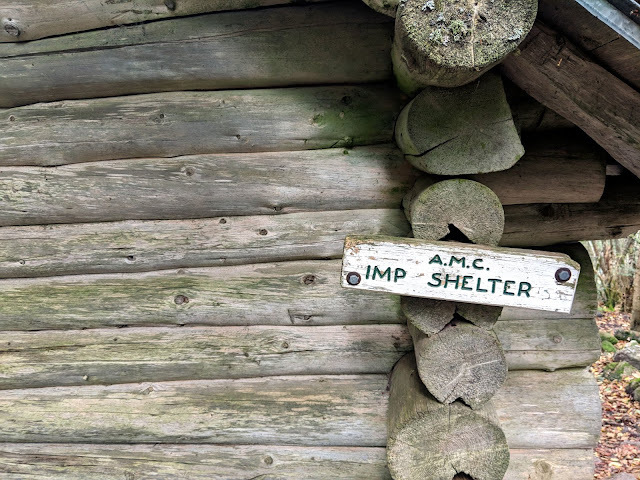 Spend the night at the Imp Shelter and follow the Imp Trail out (0.2 miles) to the AT. 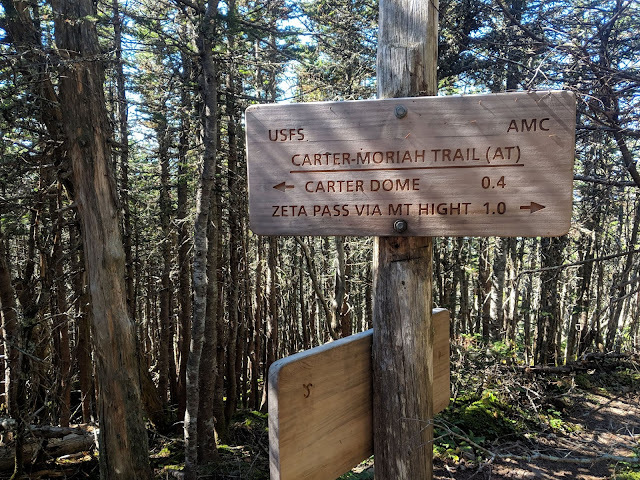 Follow the AT 1.9 miles to North Carter (steep and technical sections), 0.6 miles to Middle Carter, 1.3 miles to south Carter, 1.4 miles to Mt Hight, and 0.8 miles to Carter Dome. 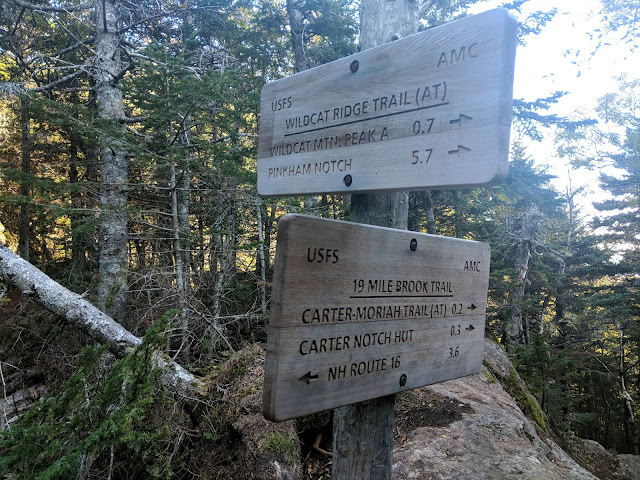 After leaving Carter Dome its 1.2 miles to the Nineteen Mile Brook Trail (blue blazed) where you can stop at the Carter Hut for water, food, or bathrooms, 1.7 miles down this trail to the intersection of 16 Mile Brook Trail, and 1.9 miles on this trail to Trailhead 2. From there you will have to hitch a ride or call an Uber back up the road to Stony Brook Trailhead. 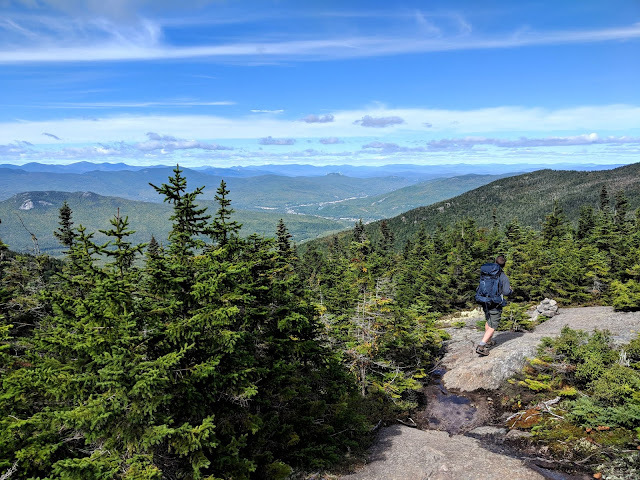 ** This is a great trail to bag four of New Hampshire's 4,000' summits. 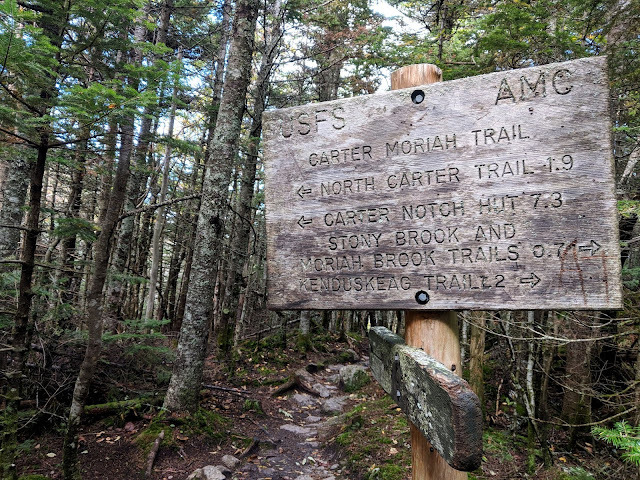 Hiking Notes: The summit of Moriah, Mount Hight, and Carter Dome were very obvious (placards, view, or a cairn). However, the other Carters were really hard to tell where the summit actually was. We hiked along the trail and sort of blew by North, Middle and South Carter. The climb up North Carter was steep.... I mean large boulder climbing straight up steep. It’s your first summit of the day so be prepared. The hike up Mt. Hight also has some elevation that gains quickly. 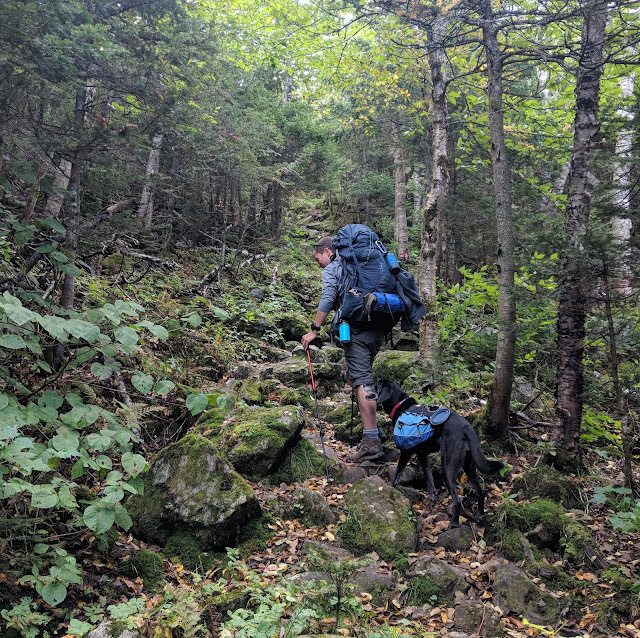 Fun note - You will see a few thru hikers making their way from Georgia to Maine. 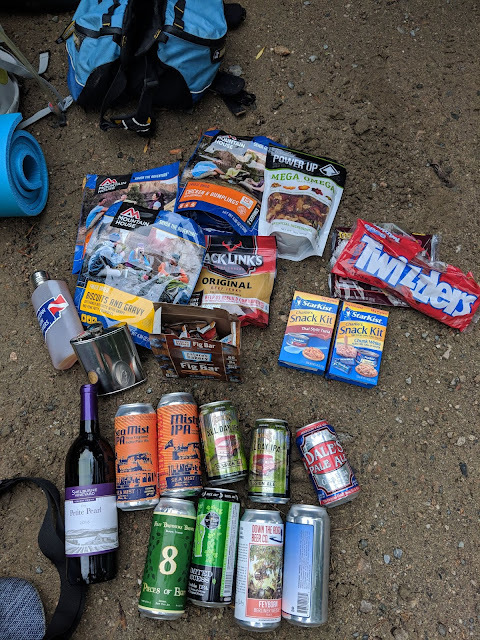 Booze: We are not ultralight backpackers. between the two of us we carried up 6 beers, one bottle of wine, two flasks and three nips. We were prepared to endure a long cold night sleeping on the ground. 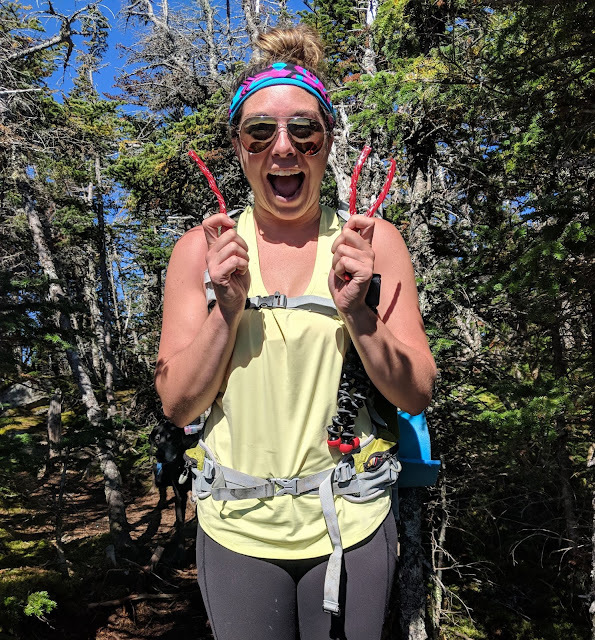 Trekking Poles: I considered them a must for this hike, craggy climbs and with the weight of the pack, I used them the entire hike. Backpacking with dogs requires a little extra planning. For Olive, I make sure I packed all her food (extra 1/4 -1/2 cup each meal for extra calories), plenty of treats, her dog bowl, her coat, booties in case she needs them, and a little bit of water. She carries her own pack (buy it here) which weighs about 5 pounds with all of her belongings. Make sure the pack is evenly weighted and if your dog is struggling, keep the pack weight light. 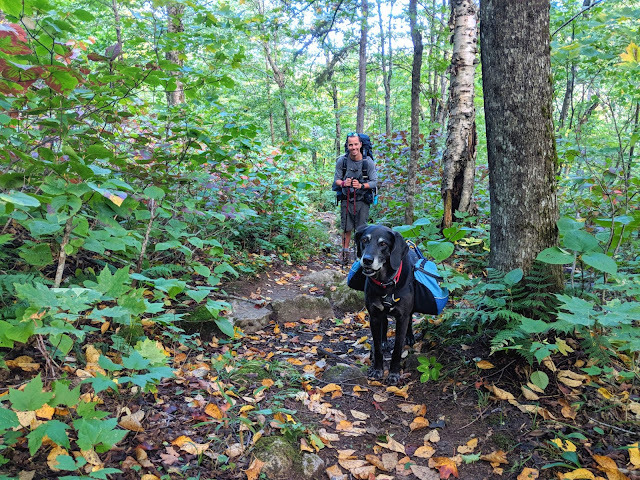 Olive is an experienced trail dog and did a great job blazing the trail. Make sure you have a first aid kit packed that included tweezers. Starting off the hike we were giddy and excited. 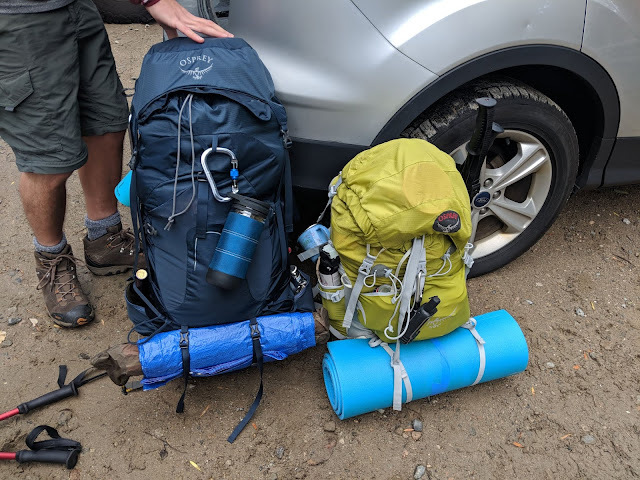 We got our bags packed, Olives bag loaded up with her supplies and began to balance our large packs on our backs in the parking lot, teetering a bit under the weight. 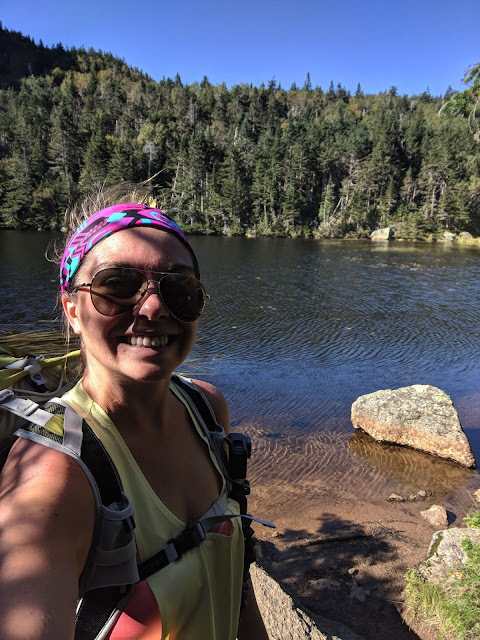 We high fived at the trailhead and then we were off, starting the hike with a relatively flat one-mile section which proved to be a perfect warmup of how to comfortably hike with 30 pounds on your back. By the time we reached the point in the hike where we started to gain elevation, I learned this was a whole different ball of wax from normal hiking. Every steep step I took up, my backpack tried its hardest to bring me back down. 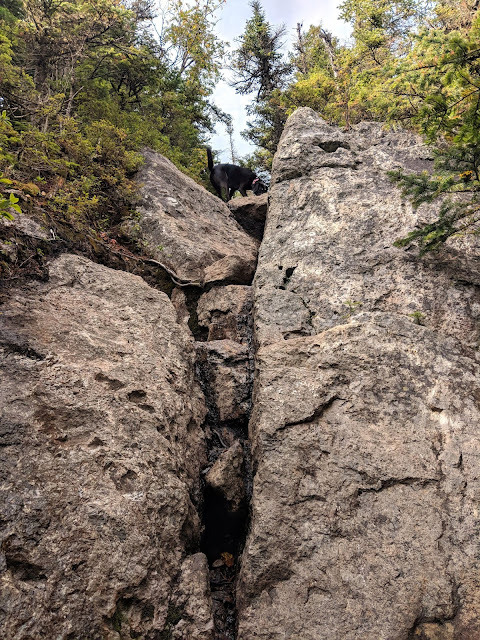 I would spend a scary second on the edge of a boulder, leaning forward trying to ensure my pack came up with me instead of pulling me back down the mountain. The trekking poles were vital in helping me maneuver along the trail, the big drops and climbs, and for balancing the weight of my pack. The incline was tough as we climbed up to the ridge, slowly picking our way up the trail with a lot of breaks along the way. 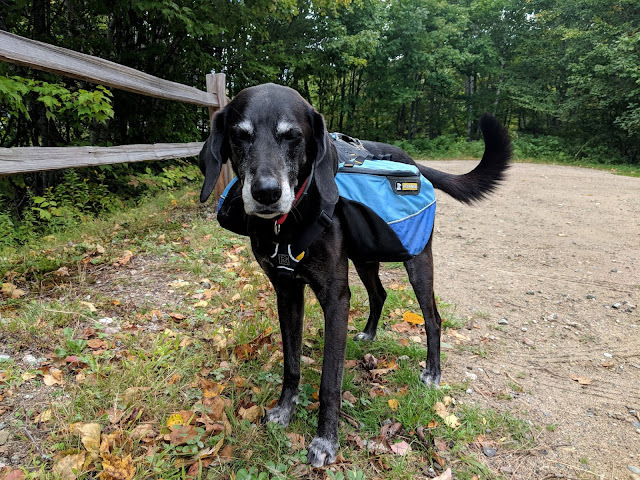 Olive scaled the steep inclines with no problems, stopping every so often to look back at us with that judgey “humans why are you going to slow” look. 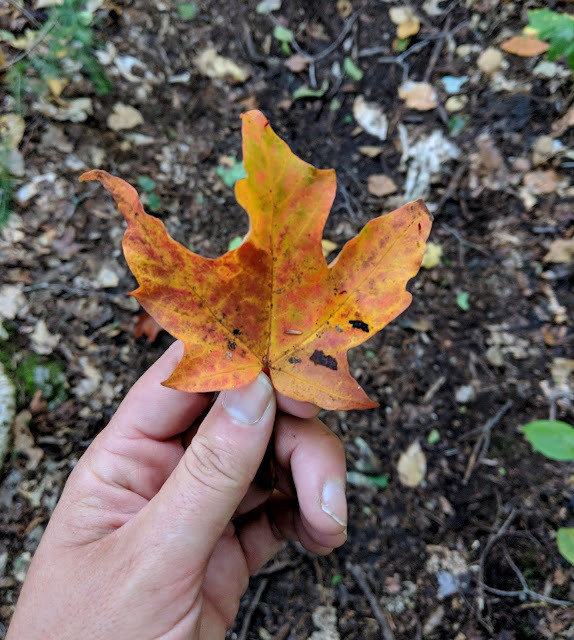 As we hiked along the trail, I couldn’t help but notice the little signs of fall around me. 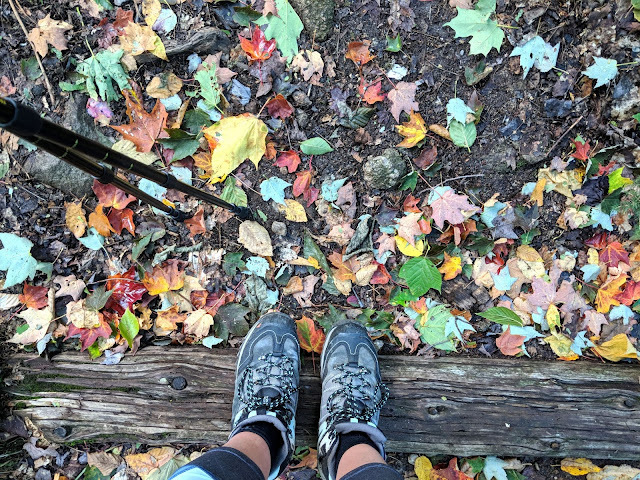 It was the official first day of fall and the cold breeze that swept along the trail was the kind you dream about in the middle of the summer. The trail was so green still but the heavy winds took those yellows and oranges off the trees and onto the trail. You could walk along the trail, picking up that perfect red maple leaf as you hiked along. 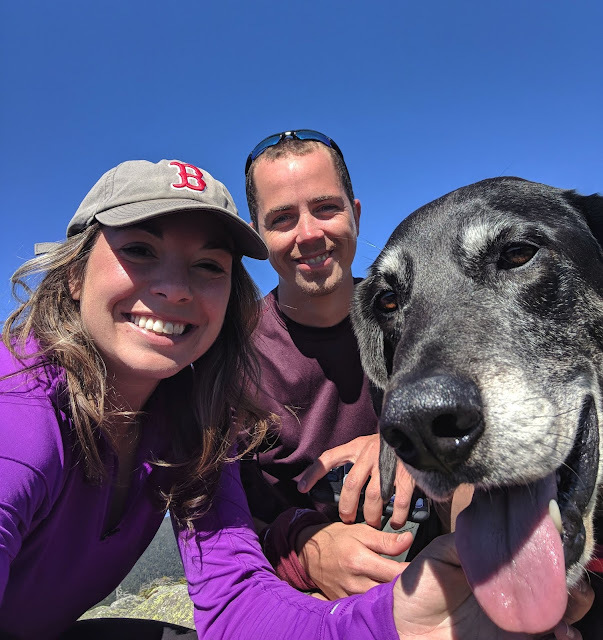 It's that weather that us New Englanders live for, the weather that is so short lasted and we spend the entire day outside talking about how special Fall in New England is. We made it to the AT pretty tired but so excited to be along the ridge and almost to our shelter. Finally we reached Imp around noon and we claimed our campsite and set up our tent. 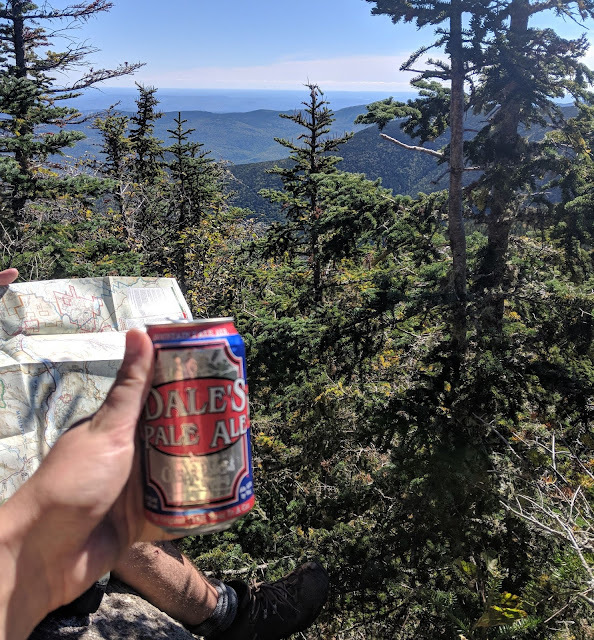 We unloaded the heavy items from our packs so we could continue on to Moriah where we enjoyed gorgeous views, whipping wind, and our first beer of the trip. The hike back to Imp felt long as we struggled with tired legs, heavy winds, and a bit more backtracking than we expected. Back at Imp we set up out hammocks, and took a hammock nap before succumbing to the wind and hiding in our tents at 6 pm. We made mountain house meals (chicken and dumplings and beef stroganoff) and happily enjoyed warm food with our wine, tucked away in our little tent staying warm. Yes, I did not leave the tent from 6pm to 6am. At this point we had every layer we brought on: gloves and hats (necessity), mid layers, jackets, long pants, clean dry socks. We were asleep before 8pm, thankful to be off the rocky ground on our tent platform, tucked away peacefully aware we were 10 miles into the woods. 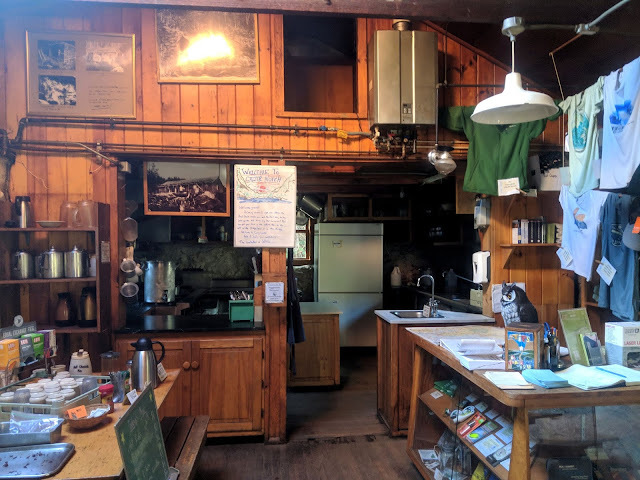 At about 6am, we made coffee and heated up another mountain house (biscuits and gravy) to start off the day. 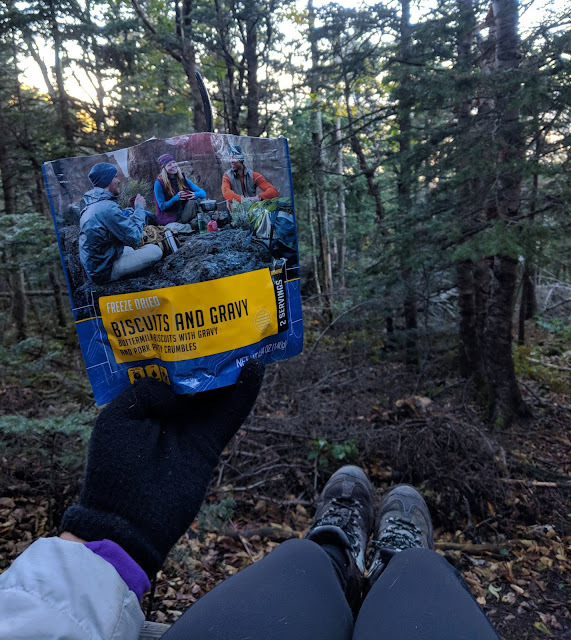 The morning was perfection, a gorgeous sunrise, the wind had died down finally and here we were, sitting on the tent platform, feet dangling over mossy rocks and a leaf-littered trail. Sipping hot coffee fresh from the press, with thick and warm biscuits and gravy, enjoying a mountain sunrise and good company. The tease of the view between the trees as we packed up camp, the New England dense tree cover giving you a sneak peak of the day ahead. Theres' something about sitting at a campsite with a hot cup of coffee deep in the woods, enjoying the absolute quiet, excited about the day ahead. We were all smiles as the day progressed, amazed at our luck in the weather as it could not have been more perfect. No wind, sunny skies, not a cloud, and an amazingly clear day that would let us see all the views we were hiking towards. 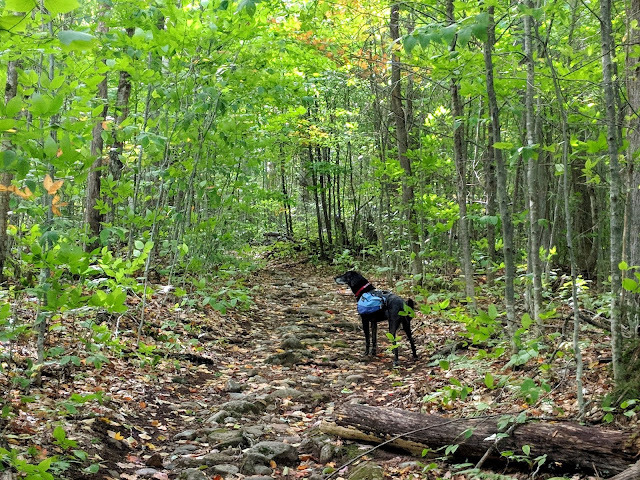 We hiked along with Olive in charge, setting a steady yet grueling pace as we followed the famous Appalachian Trail. Hike too fast you miss the views. Hike to slow you miss the Olive, and have to endure her judgey looks as she waits at the trail intersection ahead. I couldnt help but notice how quiet it was without the scowling wind of the day before. There was no one on the trail at this point, just us, a kind of quiet I had never fully noticed until I was out here deep in the woods, following a trail. 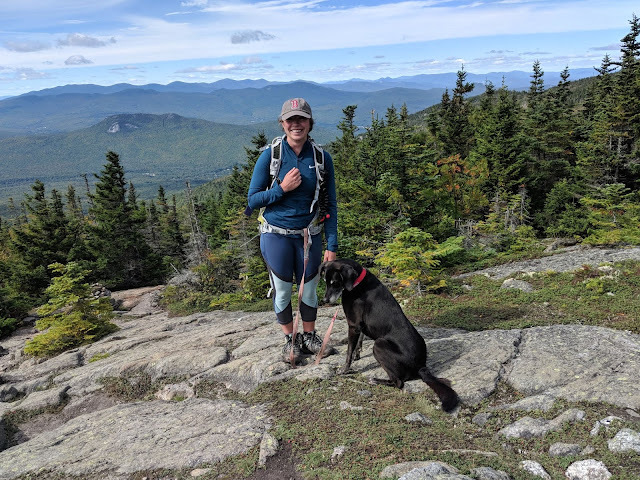 We got to our first summit around 9:30 and after the steep climb, decided that mountain time was like airport time, you can drink a beer or eat a hotdog at any hour of the day. So at 9:30, we cracked our first summit soda, vowing to share a beverage at each summit we made it to, our motivation and celebration all in one. From our first summit, it was more hard climbing, up and down summits with very few flat sections along the trail. 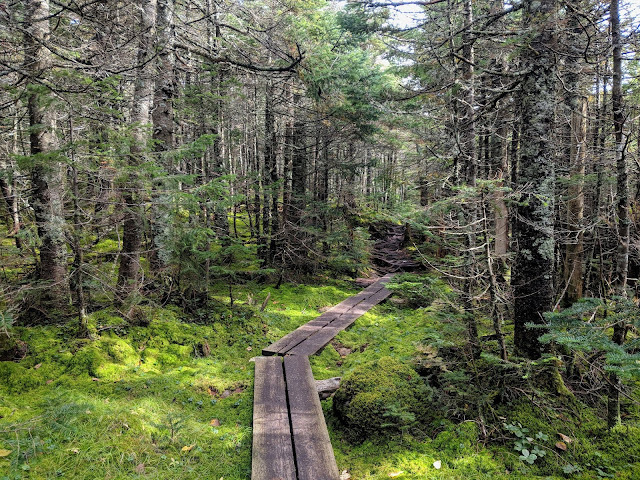 When we weren’t climbing a jagged peak, we were following mazes of wood planks through mossy green marshes. 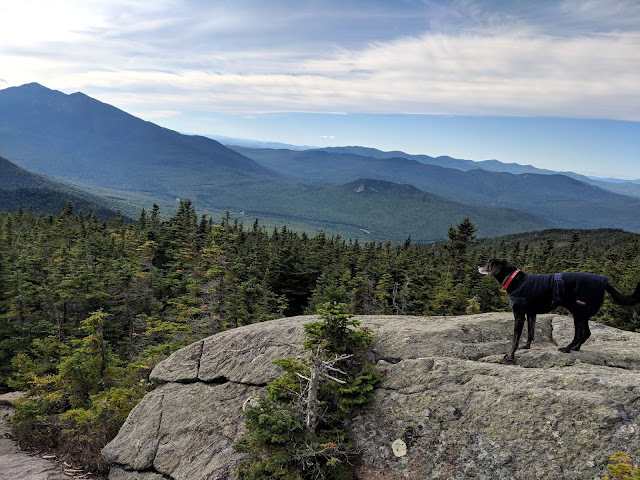 When we finally saw a view, it was a cloak of clouds below in the valley, bluebird sunny skies, and what looked like hundreds of green mountain peaks. It was the kind of day where you can’t stop smiling, where the weather gods were on point, and you were spending some time in the mountains with someone who had the same outgoing positive laughs vibe that you live for. We laughed and groaned our way up every mountain, happy to be in good company and on this beautiful mountain. Hiking long distances requires good company. It requires a positive outlook, a good sense of humor, and enough grit to take the good with the bad, endure the hard parts, and make fun of every mountain and mole hill. We made our way along the trail, our favorite stop being the beautiful Mt. Hight. The 360 degree views were absolutely phenomenal. Im talking Mount Washingtons peak visible, the auto road, the tower, everything. 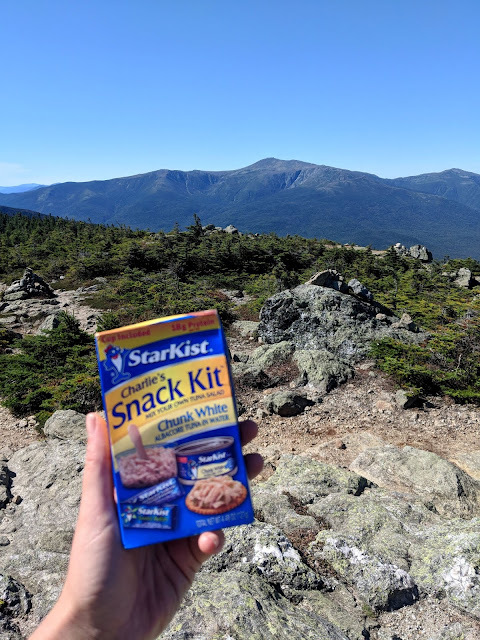 I sat on this summit, eating tuna and crackers, spooning nutella, and chatting with a few other hikers just out there enjoying the summit. Those 20 minutes relaxing on that summit, contemplating napping in the sun, is the memory I am going to hold onto when I am sitting at the office on a cold winter day. 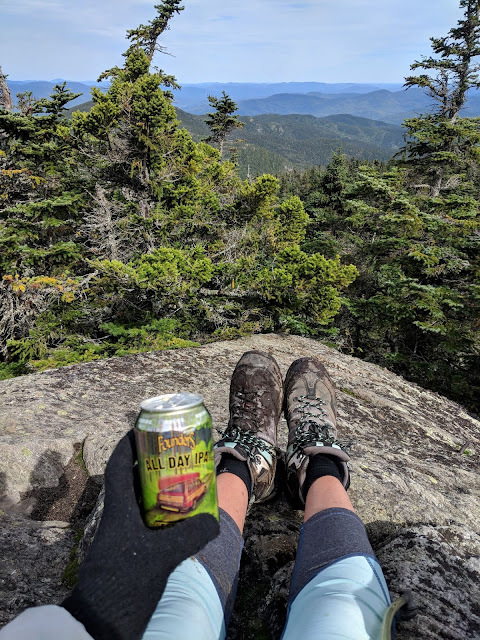 After enjoying our last beer at our last summit, we started to make our way back down the trail with a quick stop at the Carter Hut to refill on water and check the map. Once on the nineteen mile trail, we did not see another hiker until we reached the trailhead. 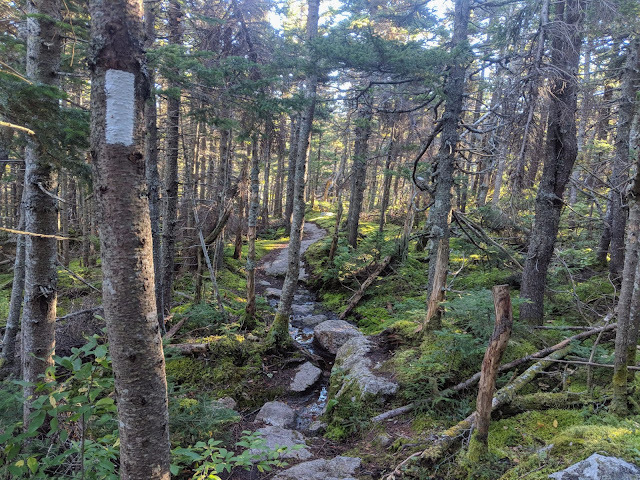 The nineteen and sixteen mile trails (blue blazed) were beautiful, making our way along the creek with stunning views and absolutely quiet. 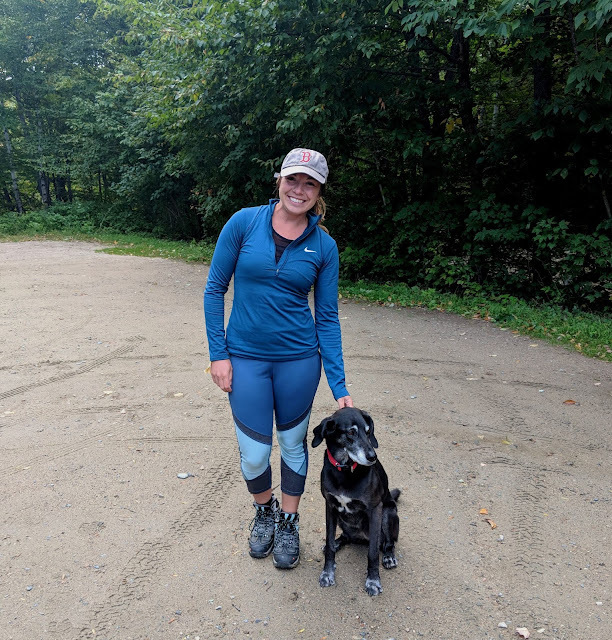 Back at the trailhead, we ditched our packs and Olive and I sat in the dirt, resting our tired legs while we sent Ryan up the road with his thumb in the air to catch a ride back to the Stony Brook Trailhead. After about 20 minutes, Ryan returns with the car and we put our tired achey bodies in the car, southbound for a greasy cheeseburger at the New Hampshire rest stop. This trip was an amazing one. It was a smile so much my face hurts kind of weekend. I drove home with a tired smile on my face, already stiff from the 22 miles we had hiked, but so damn content seeing my dog sleeping in the back of my car after 22 miles spent off leash playing in the woods with humans she adored. One backpacking trip down, many more to go. 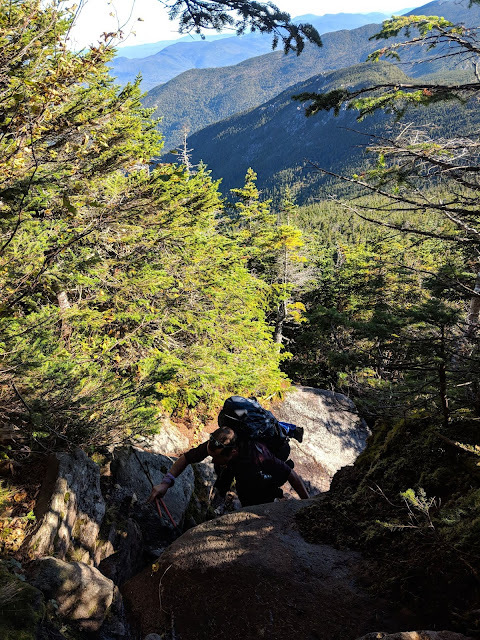 Following the 19 Mile Brook Trail back down.